Colin Barr; Michele Finelli; Anne O’Connor, eds. (Dublin: UCD Press, 2014). We are called the Italy of the West, her land so far, her soul so fiery, her glories so remote, her sorrow so deep, and her slavery so enduring. A tyrant neighbour and a young race full of hope complete the resemblance…. Our cause is the same as that of Italy – we are provinces resolved to be nations. Irish historians have (notoriously) shied away from most kinds of transnational or comparative history-writing. While some gender historians, such as Louise Ryan or Elaine Sisson, and post-colonial historians like Sikata Bannerjee, have recently produced important works that place Ireland in broader international contexts, the situation identified by Declan Kiberd’s Inventing Ireland, that Irish scholars urgently need to move beyond narrowly defined Anglophone boundaries, sadly still holds true. This collection compares and contrasts mid 19th century Irish nationalism with the Italian Risorgimento. 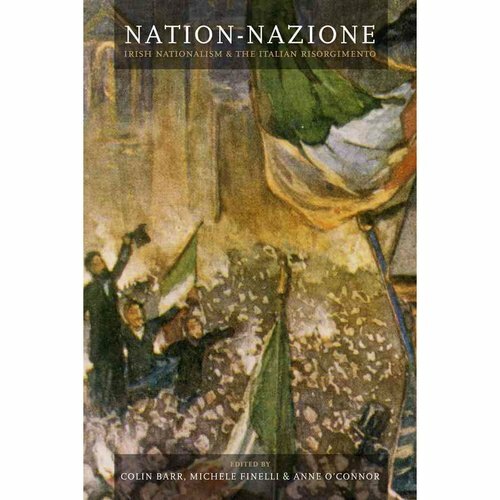 Nation/Nazione, a collection of twelve essays that compare and contrast Irish and Italian nationalism, is thus a welcome, if sometimes uneven addition. As the title suggests, the focus is restricted to the Risorgimento of the 1860s and Italian unification’s main architects, Mazzini and Garibaldi, cast a long shadow over this book, with essays clustered around themes of Leadership, War, Reaction and Interaction and, finally, Culture and Gender. Michele Finelli’s introductory programmatic essay traces the history of Italian-Irish comparative historiography. Unsurprisingly, it is a scant history that makes for a frustratingly slight discussion. Roland Sarti’s overview of Giuseppe Mazzini’s contribution to European democratic thought is one of the outliers of the collection. The Italian patriot Mazzini held by some to be the ‘father of European democracy’ was against Irish independence. His claim that Mazzini was the ‘Father of European Democracy veers into dangerously hagiographic territory; his essay thus elides the elitism and racialist assumptions underpinning Mazzini’s body of thought. Plus, he has little to say about Ireland other than to briefly note Mazzini’s opposition to Irish separatism. Alberto Belleti’s contribution is more satisfactory. A micro-historical study of the oration at Daniel O’Connell’s funeral mass (he died in Genoa en route to Rome in 1847), Belleti expands out to study the intellectual development of The Liberator’s eulogiser, Giocacchino Ventura. Like the subject of his 1847 oration, Ventura was also trapped between radical liberalism and conservative Catholicism. As well as investigating this intriguing comparison, Belleti brings forth a bizarre piece of O’Connell trivia: after his corpse was dispatched back to Ireland for burial, O’Connell’s heart was donated to Rome in a silver horn but subsequently disappeared and was possibly stolen by thieves unaware of the silver horn’s contents. Ciaran O’Carroll’s essay continues in partly the same anecdotal register, analysing the motivations and actions of the Irish Papal Brigades, a small group of Irish pro-Vatican soldiers who fought against Italian unification. At the height of the Risorgimento in 1860, between 1300 and 1400 Irish troops were recruited for an ill-fated Battalion of Saint Patrick tasked with defending the Papal States. At the height of the Risorgimento in 1860, between 1300 and 1400 Irish troops (O’Carroll offers differing figures) were recruited for an ill-fated Battalion of Saint Patrick tasked with defending the Papal States. The recruits were largely drawn from comfortable middle-classes across Ireland, although cautiousness over whether the Brigades violated the British government’s Foreign Enlistment Act meant that some bishops blocked recruitment in their respective dioceses. O’Carroll does a deft job of showing how events in Italy were filtered through Irish nationalist and Catholic lenses and how the Brigade’s expectations soon collapsed under the weight of poorly organised Papal State realities. Building on this, Anne O’Connor’s short but incisive paper discusses Italian perceptions of these Irish Papal defenders, which ranged from the racist (they were seen as primitive Irish savages) to the condemnatory (they were seen as mercenary defenders of a reactionary papacy on the wrong side of history) to the critical but surprisingly sympathetic, as some Italian nationalists took pity on recruits seen as the dupes of a conniving Catholic hierarchy. Reversing this lens, Jennifer O’Brien reviews Irish perceptions of Italian state building. As with O’Carroll’s analysis, O’Brien not only shows how Italian politics was reinterpreted via Irish concerns, but also how this could have some surprising results – Irish Catholic nationalists were generally unfavourable to Italian nationalism (for pro-Rome reasons) while Protestant Unionists, echoing a general pro-Garibaldi feeling in Britain, threw their support behind rebellious Italian nationalists. Indeed, O’Brien’s paper shows the great potential for transnational understandings of Irish nationalism (although it is difficult not to suspect that O’Brien over-determines how much 19th century Irish politics can be reduced to a narrowly defined Catholic-Protestant binary). Colin Barr’s study of Paul Cullen’s influence on contemporary Irish politics investigates the danger, in the Cardinal’s mind at least, that anticlerical events in Italy were being replicated by Fenians and Young Irelanders at home. Thus, not only does Barr highlight the multifaceted dynamics at work in elite Catholic conservative politics, but again shows how this international focus has so much to commend it. While Andrew Shields positions his paper, a survey of attitudes with the predominantly Protestant Irish Conservative Party, as a companion piece to O’Brien’s, it also sits easily alongside Barr’s contribution. Like Marta Ramón’s contribution, an attempt to understand how Irish nationalists balanced their Catholicism with their sympathies for another national struggle, though, Shields’ examination deepens earlier analyses rather than broadening the range of the book. The final set of three papers changes tack somewhat, moving from religion and high politics to culture and gender. This volume is a good example of how Irish history should engage with the wider world. Emanuela Minuto’s innovative approach uses Italy’s changing attitudes to poet and lyricist Thomas Moore, as a means to sketch out an alternative history of nineteenth century Italian cultural and political history. Donatello Abbate Badin’s less satisfying paper takes at its starting point the quixotic Lady Morgan, ‘an apologist of the early Risorgimento’. The paper’s title, ‘Female Agency in the Risorgimento’, suggests a discussion of women’s active roles in nineteenth century Italian politics but the result is instead frustratingly slim. Conversely, Emer Delaney’s essay compares and contrasts the roles women played in Irish and Italian nationalism. Drawing on the influential work of the feminist scholar Anne McClintock, Delaney’s essay marks a more convincing advocacy for feminist and gender history and so concludes the volume on a strong note. Given its broad-reaching scope, Nation/Nazione provides an exhaustive overview of Irish nationalism’s interactions with, and parallels to, the Italian Risorgimento. The editors’ introduction identified their book as ‘a continuing dialogue.’ And while this volume’s small amount of short-comings show how necessary that dialogue still is, Nation/Nazione’s many strong points also go a long way to providing a firm foundation for future work. Aidan Beatty is a PhD Candidate at the Department of History in the University of Chicago. See his previous articles on Irish nationalism and Zionism here and here. The Nation, 25 February 1843. Quoted in ‘Nation/Nazione’, 178.